Dr. Treva Gear for HD 175 50 Day Countdown Begins. Here’s What You Need to Know. Julie is a California native who was adopted at two weeks old and raised in Lancaster. She became the first member of her family to graduate from college after attending Cal Poly San Luis Obispo on a basketball scholarship. She became a coach for the Georgia Southern Women’s Basketball Team while completing her Master’s of Science in Sports Management. During her eight years at Hinesville Middle School, Julie was a coach for basketball and soccer, served as Athletic Director and later became certified to become a school counselor. She returned to Georgia Southern University from 1995 to 1997 to earn a Master’s of Education and Education Specialist in Counselor Education. As a resident of Saint Simons Island for the past 19 years, Julie has worked in public schools as a school counselor at Needwood Middle School, Glynn Middle School and currently serves as Registrar at Glynn Academy. From 2012 to 2015, Julie served as President-Elect, President and Past President for the Georgia School Counselors Association which has more than 1,000 members. 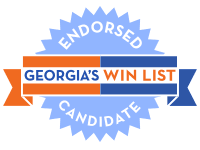 Julie also supports the 100 Miles environmental group focused on protecting Georgia’s coastline and Georgia Equality. She is a Democratic Party Precinct Captain, a leader of the Women’s Voices of Glynn County, a member of the Glynn Dems Executive Committee, and a Glynn County liaison to Greening Georgia, an environmental caucus of the Democratic Party of Georgia. Economic Development and Living Wage – “Everyone deserves to earn a living wage,” Julie says. “No individual or family should struggle to make ends meet. In Glynn County, the average wages are below the national average.” Julie will strive to attract new businesses and will help build and develop opportunities for higher wage jobs. Preservation of Coastal Georgia – Julie is passionate about maintaining the natural beauty of the Glynn County Environment. She will strive to ensure the safety of the waters and protect native wildlife. She is strongly opposed to offshore drilling and pledges to work to prevent it. Quality and Affordable Healthcare – Julie believes that quality healthcare should not become a financial burden for families. Julie will work to increase access to affordable and quality healthcare in Glynn County. She supports rural hospitals and will work to reduce the physician shortage as well as increase the availability of primary care facilities. Expand Access to Childcare and Pre-K Education – Julie believes access to quality, affordable childcare along with early childhood education is beneficial to children and their families. These benefits include lower retention rates and higher graduation rates. Julie wants to increase access to quality Pre-K education and provide transportation to Pre-K programs. Georgia women like Julie are making history in this midterm election cycle as they run for seats long held by Republicans. With women in record numbers on the ballot this year, WIN List needs your help to elect these women and train the candidates we want to see on the ballot in 2020 and beyond.